We use the method shape to see how many rows and columns that we have in our dataframe. This method is very similar to the dim function in R statistical programming language (see here). Read the Pandas Excel Tutorial to learn more about loading Excel files into Pandas dataframes. In the code above we created a new dataframe, called df200, with 200 randomly selected rows. Again, we used the method shape to see how many rows (and columns) we now have. It’s of course very easy and convenient to use Pandas sample method to take a random sample of rows. Note, however, that it’s possible to use NumPy and random.choice. In the example below we will get the same result as above by using np.random.choice. Now that we have used NumPy we will continue this Pandas dataframe sample tutorial by using sample’s frac parameter. This parameter specifies the fraction (percentage) of rows to return in the random sample. This means that setting frac to 1 (frac=1) will return all rows, in random order. That is, if we just want to shuffle the dataframe it can be done using sample and the parameter frac. As expected there are as many rows and columns as in the original dataframe. We can use frac to get 200 randomly selected rows also. Before doing this we will, of course, need to calculate how many % 200 is of our total amount of rows. In this case it’s approximately 1% of the data and using the code below will also give us 200 random rows from the dataframe. Note, the frac parameter cannot be used together with n. We will get a ValueError that states that we cannot enter a value for both frac and n.
We can, of course, use both the parameters frac and random_state, or n and random_state, together. In the example below we randomly select 50% of the rows and use the random_state. It is further possible to use replace=True parameter together with frac and random_state to get a reproducible percentage of rows with replacement. The sample method also have the parameter weights and this can be used if we want to increase the probability for certain rows to be sampled. We start of the next Pandas sample example by importing NumPy. The code above may need some clarification. In the second line, we used Pandas apply method and the anonymous Python function lambda. 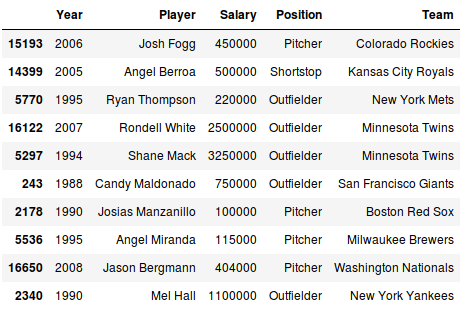 What it will do is run sample on each subset (i.e., for each Player) and take 2 random rows. Note, here we have to use replace=True or else it won’t work. Say that we want to take a random sample of players with a salary under 421000 (or rows when the salary is under this number. Could be certain years for some players. This is quite easy, in the example below we sample 10% of the dataframe based on this condition. We may want to take a random sample from our dataframe and remove those rows. Maybe we want to create two different dataframes; one with 80% of the rows and one with the remaining 20%. Both of these things can, of course, be done using sample and the drop method. In the code example below we create two new dataframes; one with 80% of the rows and one with the remaining 20%. Finally, we may also want to save the to work on later. In the example code below we are going to save a Pandas sample to csv. To accomplish this we use the to_csv method. The first parameter is the filename and because we don’t want an index column in the file, we use index_col=False. That was it! Now we should know how to use Pandas sample.